The Health Intervention and Technology Assessment Program (HITAP) is a semi-autonomous research unit under Thailand’s Ministry of Public Health. 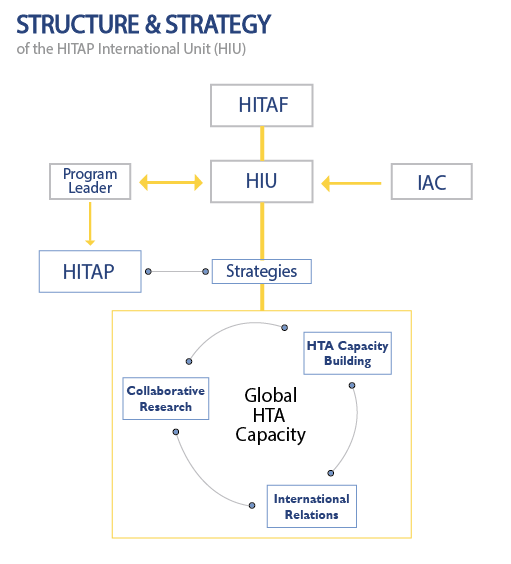 HITAP established the HITAP International Unit (HIU) in 2013 to collaborate with international partners and networks to improve the use of Health Technology Assessment (HTA) and priority-setting for Universal Health Coverage (UHC) in low- and middle-income countries. HIU draws upon the experiences of its experts to match the growing demand for evidence-informed policy at the global level. Under HIU, dedicated professionals collaborate to provide our partners in different countries the means with which to build institutions for HTA and priority setting at the local, national and global levels. In this effort, HIU draws upon its experiences locally and various countries to become a regional hub for HTA and enable South-South collaboration. To this end, HIU works with international organizations, non-profits, and overseas governments to develop evidence-based priority setting practices globally. Building HTA capacity for a better society. Coordinate technical support and policy advice from relevant institutes in Thailand. HIU’s goal is to collaborate with international partners and networks, acting as a regional hub, working to improve HTA and Priority-setting capacity through research and capacity building activities in low- and middle-income countries. In pursuit of this goal, our working model functions as follows: guided by our mission, facilitated by our structure and supported by our strategies, we engage in projects, activities and partnerships that realize our vision of Building Health Technology Assessment Capacity for a Better Society.